Cool hardware in an average laptop. The Asus K55VM-SX064V is offered by online stores for prices starting at about EUR 840 (~$1050) which is a steep price for a 15.6 inch notebook. You should expect quality hardware, service and high performance for the amount being spent. We will see if Asus ticks all the boxes with its offering in this review. Asus launched the K55VM-SX064V as a successor to the Asus K53SV-SX131V. The K55VM-SX064V is a powerful all-round notebook, based on Intel's latest platform, "Ivy Bridge". Equipped with a quad-core processor (Intel Core i7-3610QM), a middle-class graphics chip (Nvidia GeForce GT630M), 8 GB of RAM and a hard drive (Hitachi Travelstar 5K750), which offers 750GB of data storage space, this machine should be able to handle most workloads that a user might encounter. It exceeds the abilities of its predecessor (K55VM-SX064V) significantly. 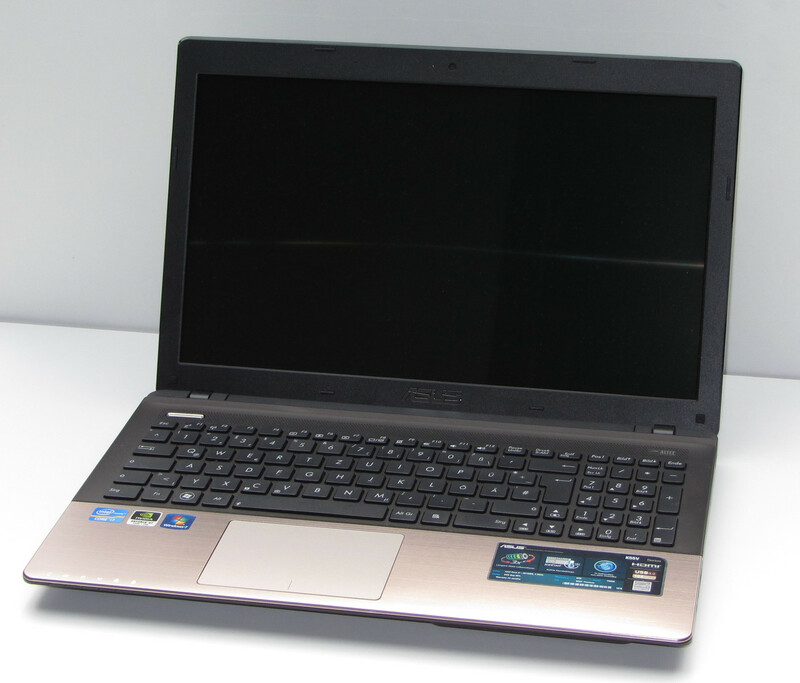 The K53SV-SX131V had a dual core processor (Intel Core i5-2410M), 4GB of RAM and a 640GB hard drive. Both laptops have very similar graphics performance as the GT540M and the GT630M run on the same chip. The case is mostly made of plastic with the exception of the wrist-rest area which is made out of metal. This is a significant divergence from the design of the Asus K53SV-SX131V whose body consisted mostly of metal. Both the lid and the bottom of the notebook are textured which reduces fingerprint smudges on the device. 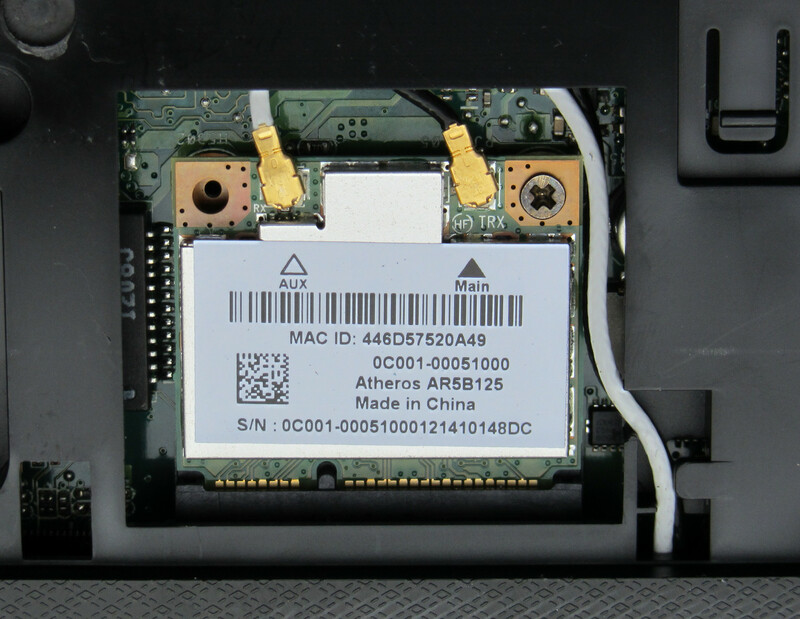 The bottom of the notebook has a single flap with two screws, which can be removed to access the HDD, RAM modules and the WLAN card. There is no access to the fan. The stability of the case is satisfactory. The finish is fine. The hinges keep the display from wobbling. All in all, it is a good, stable case. The Asus K55VM-SX064V will not win beauty contests though. Because of the plastic, the device seems a little cheap, but this is a matter of taste. 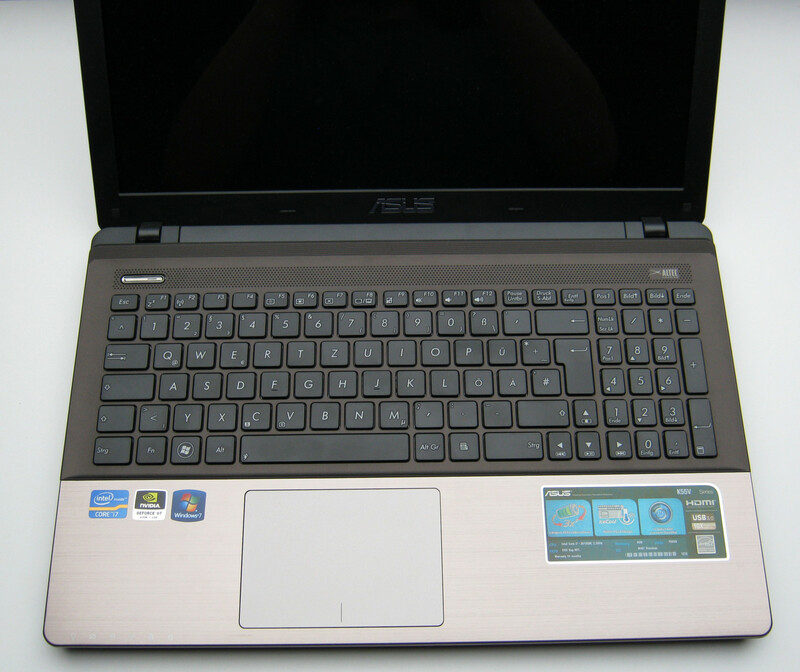 In terms of connections, the Asus K55VM-SX064V offering is standard for this class of notebooks. On the left side of the notebook you find a VGA output, an HDMI output and the RJ45 Gigabit Ethernet port and two USB 3.0 slots. On the right, you will find the microphone and headphone jacks. There is a third USB port but it is of the older USB 2.0 specification. At the front, you have access to the memory card reader. It is protected by a dummy SD card to prevent it from getting dusty. The reader only supports SD and MMC cards. For most consumers that should be enough. More and more laptops only support these types of memory cards. This is due to the fact that the SD card has the dominant position against almost all the other types of memory cards. People looking to use other types of memory cards will need to make do with USB card readers. There is no Express Card and Firewire slot. This is not surprising as both ports can hardly be found nowadays in consumer notebooks. Still, a Firewire port in such a notebook would have been a useful component. This would benefit users with recording equipment (which has firewire ports for transferring data) who would like to edit videos on the laptop as they have the advantage of having access to powerful processor like the Intel Core i7-3610QM. Communication options fall short for such a notebook. There are a Gigabit Ethernet port and a Wi-Fi module. The WLAN module supports the 802.11b/g/n standards. A Bluetooth module is not available. This is quite surprising as the same laptop is sold by Asus with a Bluetooth module in other countries. Asus ships the notebook with a 120W power supply and a 50Wh / 4700mAh battery. 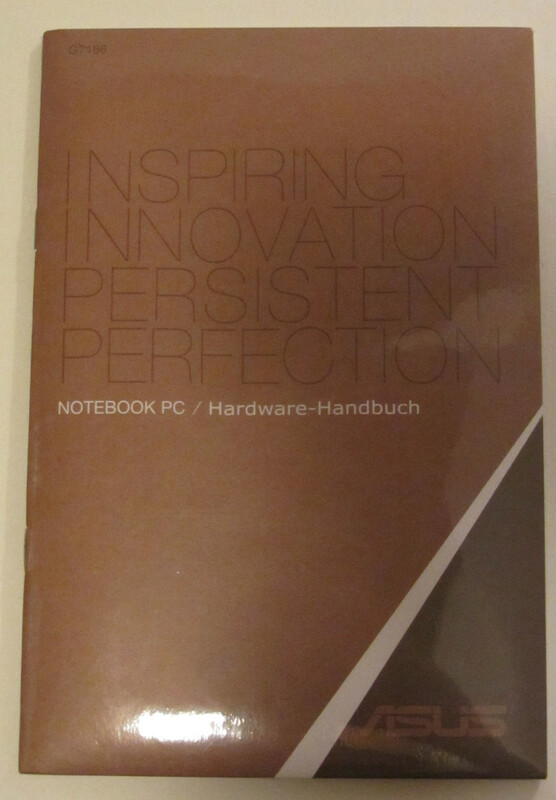 Also included are a thin user manual and a driver CD (Windows 7). A Windows 7 installation DVD is not included (we will have an article that will tell you how you can get a Windows 7 DVD for free). Reinstalling the operating system is possible using the recovery partition. Additional software like McAfee Internet Security and CyberLink Media Suite (a burning program for CD / DVD) come pre-installed. Asus has also included its own proprietary tools for some functions. 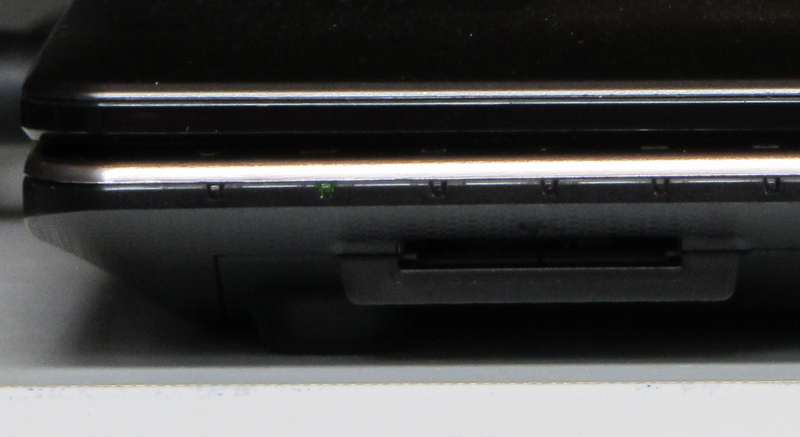 The hard drive and memory can be accessed via a large hatch at the bottom which is held by two screws. The notebook has two memory slots that are already in use. 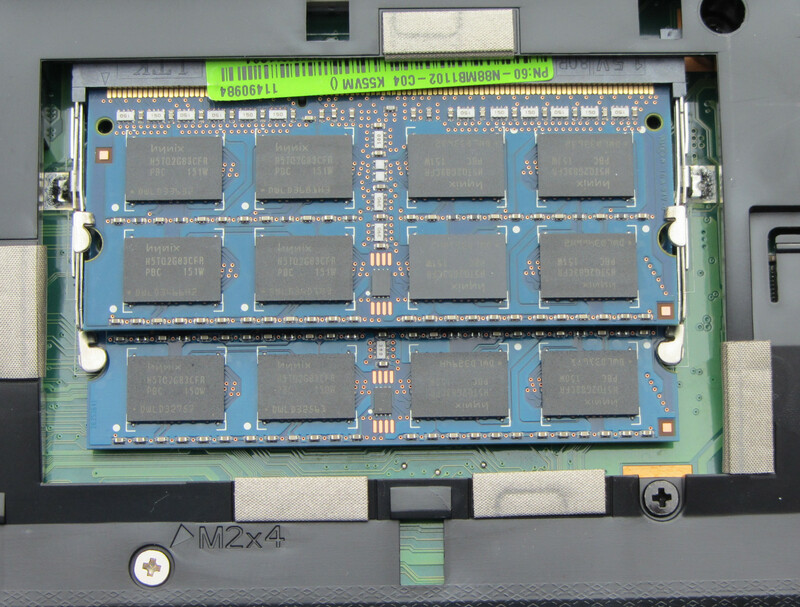 If RAM is insufficient, the installed 8 GB of memory can be easily replaced with larger modules. The notebook can hold a maximum of 16GB of memory. The hard drive can be easily removed and replaced in favor of a different storage device (like an SSD or a hybrid drive). There is no access to the fan though. The device comes with a 24-month warranty. 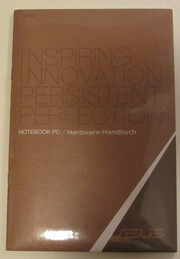 The notebook can be sent to Asus or to one of its designated service centers. An extended warranty of 36 months can be purchased separately for EUR 70 (~$90). However, the additional warranty has to be purchased within 90 days of the laptop’s purchase. A warranty purchase is not possible after this period. The Asus K55VM-SX064V is equipped with a chiclet keyboard with a number pad. The dimensions of the main keys are 15mm x 15mm, the F keys 13mm x 9mm and the number pad keys 12mm x 15mm. The key spacing is 4mm. The key size and key spacing make for a comfortable typing experience. Key travel is sufficient but we would like to see a firmer stroke. The keyboard is not backlit. Asus builds the K55VM SX064V with a click pad. It is a touchpad without separate mouse buttons. Pressing down anywhere on the pad will trigger a (left) mouse click. But you will need to access the bottom right of the clickpad (12mm above the lip) for the right click function. Asus separates the right and the left mouse button using a colored marker. Touchpad detection is very accurate and its ability to interpret finger position for a left or right mouse button click is good. The touch pad is supports multi-touch gestures, which can be extremely useful in certain situations like photo resizing, etc. The touchpad is very large with at 7.3cm x 10.4cm. Fingers can comfortably glide over the surface of the touchpad. But the touchpad is extremely sensitive mistaking pointer motions for clicks. But you get used to it quickly. Drag and drop works fine. Asus uses a 15.6-inch glossy display with a resolution of 1366 x 768 pixels for the K55VM SX064V. The older Asus K53SV-SX131V uses the same display. There are no other display options for this model. The Asus K55VM-SX064V offers the expected display quality in this price range. A higher-resolution display (1600 x 900 pixels or higher) would have allowed it to stand out from the crowd. The display brightness was measured to be 192 cd/m2, with fairly even illumination of about 89%. The contrast ratio of 183:1 is not very good due to the high black level of 1.08cd/m². Blacks don’t appear as shades of grey in darker regions of the image. 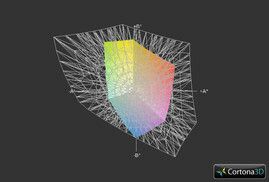 Both the sRGB and Adobe RGB color spaces are not covered by the display. 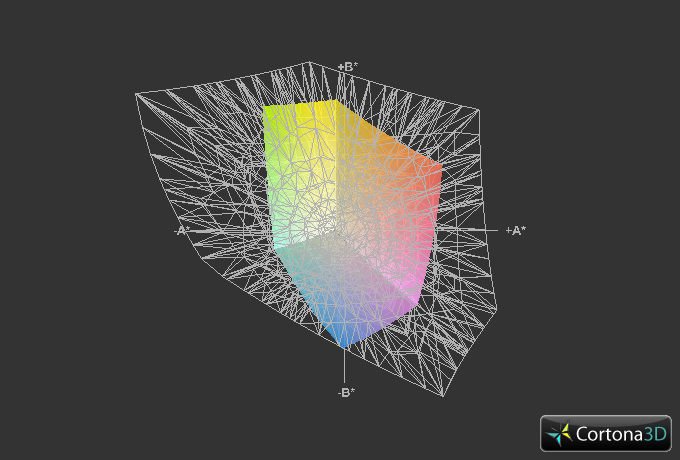 The incomplete coverage of the sRGB color space does not affect the average user though. 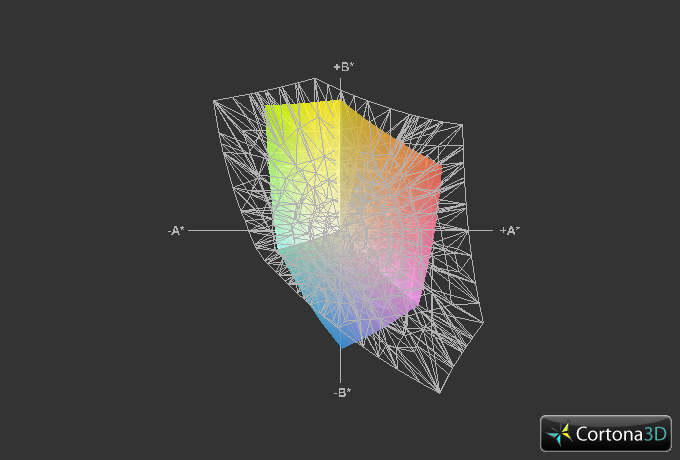 The difference to the Adobe RGB color space is ​​considerably larger. This fact excludes the display as an option for professional work like photo editing. Basically, the brightness of the display is sufficient (maximum of 198cd/m² on battery power) for outdoor use. However, the glossy display makes it quite impossible to be productive in bright environments due to the irritating reflections on the screen. Using it outdoors is possible in a shady area at best. The viewing angles of the screen could be better. Slight changes in the vertical viewing angle shift colors in pictures rapidly. Horizontal viewing angles are decent with some stability in the quality of the image with small changes in the display angle. It is possible to crowd in front of the screen but care has to be taken that the level of sight for the viewers be the same. We would classify the Asus as an ‘all-round’ laptop offering some high performance hardware. 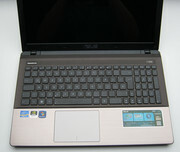 The built-in processor and graphics allows the device to be used for gaming, video editing and DVD playback. The performance is also enough for the playback of Blu-ray discs, but a compatible drive was not built into the notebook. Other versions of the device are currently not offered in Germany. 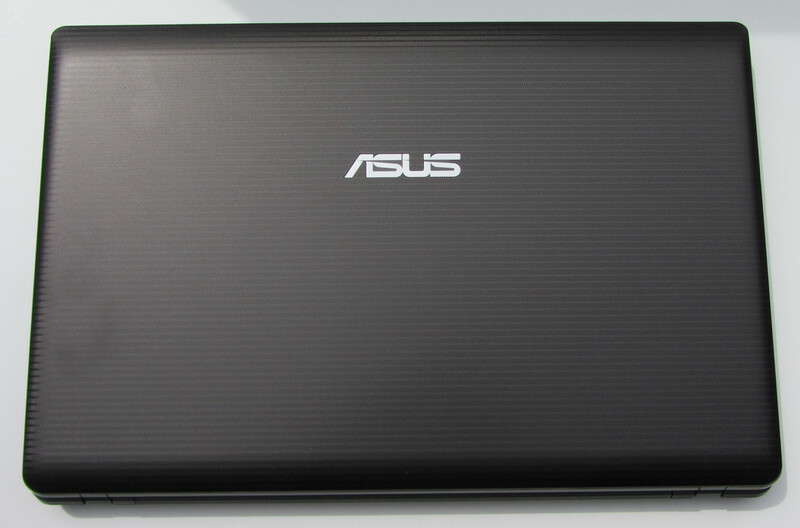 Asus uses an Intel Core i7-3610QM processor for this laptop. The Core i7-3610QM is part of Intel's latest processor generation 'Ivy Bridge'. It has four cores and two threads per core. The CPU operates at speeds up to 2.3GHz. The operating system may overclock the processor to 3.3GHz (Intel Turbo Boost) if needed. However, only one core can be accelerated. If the operating system overclocks all cores at the same time, the turbo frequency is locked at 3.1GHz. The turbo boost is also available in battery mode. But Turbo is restricted to very few instances in this case. The CPU frequencies were recorded using HWInfo. The processor provides more than enough power for all possible use cases. In the various benchmarks like Cinebench, the Asus K55VM-SX064V is practically on par with other notebooks that have the Core i7-3610QM. The Asus K53SV-SV131x with its slower hardware stands no chance of competing with the Asus K55. The notebook runs smoothly and applications load quickly. The PCMark results support this impression. Comparable notebooks like the Medion Akoya P6633 (Intel Core i5-2450m, Nvidia GeForce GT630M) and the Acer Aspire 5755G (Intel Core i7-2670QM, Nvidia GeForce GT630M)) are beaten by the Asus K55VM-SX064V. Even the older Asus K53SV-SX131V (Intel Core i5-2410M, Nvidia GeForce GT540M) has no chance here. The values ​​of the K55VM-SX064V are about 30 percent higher than those of the K53SV-SX131V. Only the Windows boot process is a little slow. You realize at this point that Asus has included a rather slow hard drive in the notebook. We discuss the hard drive characteristics in the next section. 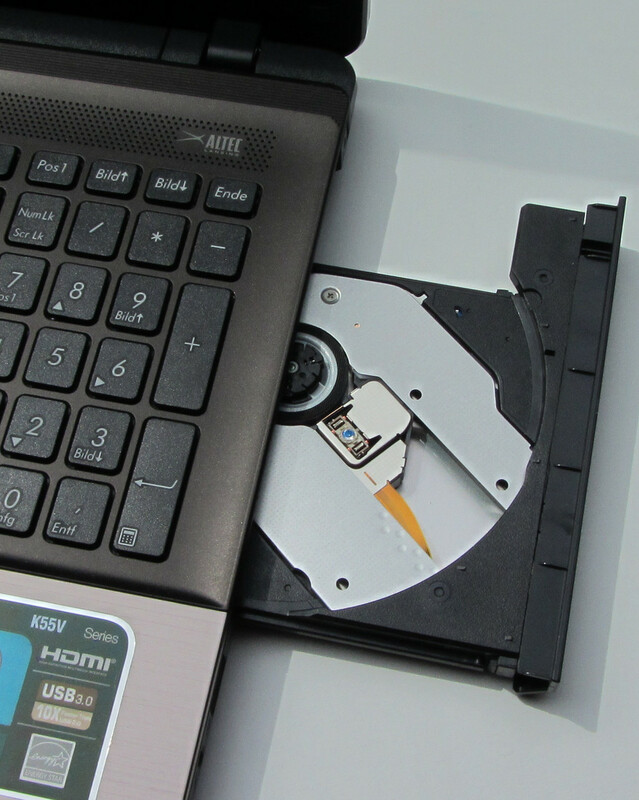 The hard disk is one of the weaknesses of the notebook and throttles system performance. Asus has included a Hitachi Travelstar 5K750, which operates at 5400 RPM and offers 750GB of storage capacity. HD Tune and CrystalDiskMark results show that HDD performance is at best average for such a pricey notebook. Also, the Windows 7 performance index shows the hard drive as the weakest part of the system. Asus should have provided this laptop with at least a 7200rpm drive that would have given the user a better experience handling the notebook. This would have resulted in higher Windows experience index and PCMark scores. The graphics provided should support some video editing, but the HDD does slow down the process due to the requirement of low access and load times necessary for this operation. The only positive we could find was the large storage (750GB) that allows the user space for movies, pictures and music. The Asus K55VM-SX064VM is equipped with two graphics chips: the integrated Intel HD 4000 graphics chip and the Nvidia GeForce GT 630M as a dedicated graphics chip with 2GB of VRAM. Both GPUs support DirectX 11. The laptop uses Nvidia's "Optimus" technology. The relatively power hungry GeForce GT 630M graphics chip is used only when the integrated Intel HD4000 graphics chip does not provide enough processing power. 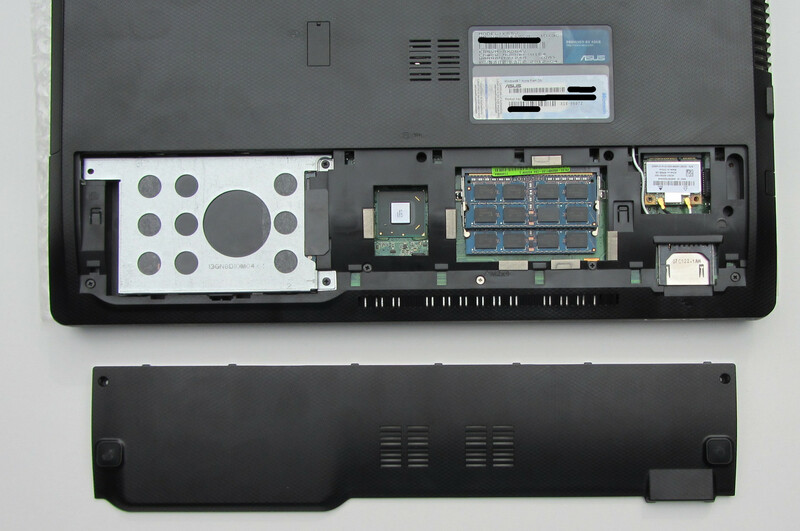 This switching is done automatically in the background.This automatic switching helps the laptop extend the battery life by running the HD4000 when the dGPU isn’t necessary. The GeForce GT630M graphics chip is a lower-middle class GPU and should provide enough power to play computer games smoothly at low screen resolutions. The 3DMark benchmark quantifies the graphic capabilities of the GPU. 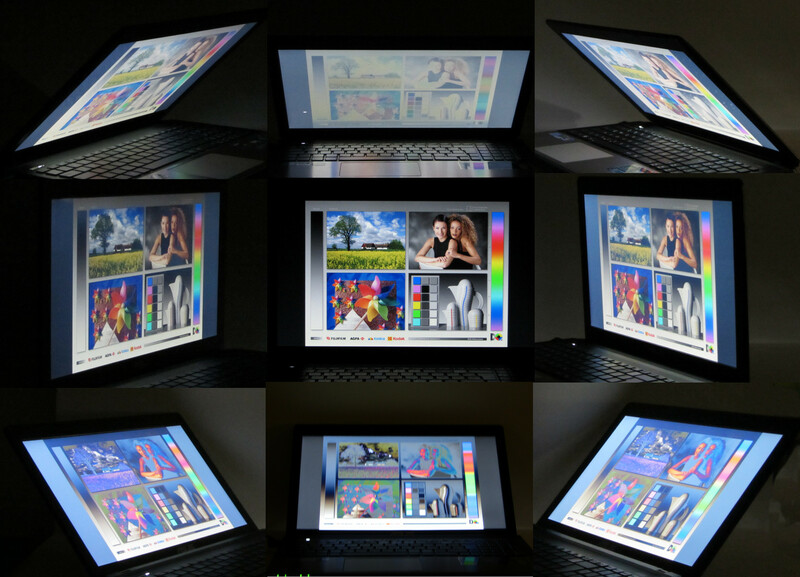 The results are on the same level of other notebooks that include the GeForce GT630M. Like all the graphics chips from Nvidia, the GeForce GT630M also supports Nvidia’s "CUDA" technology. This makes it possible to use the computing power of graphics chips for other applications like accelerating the conversion of a video file into H.264 format. Freeware like ‘Mediacoder’ and commercial software like ‘DVD Fab’ support CUDA technology. 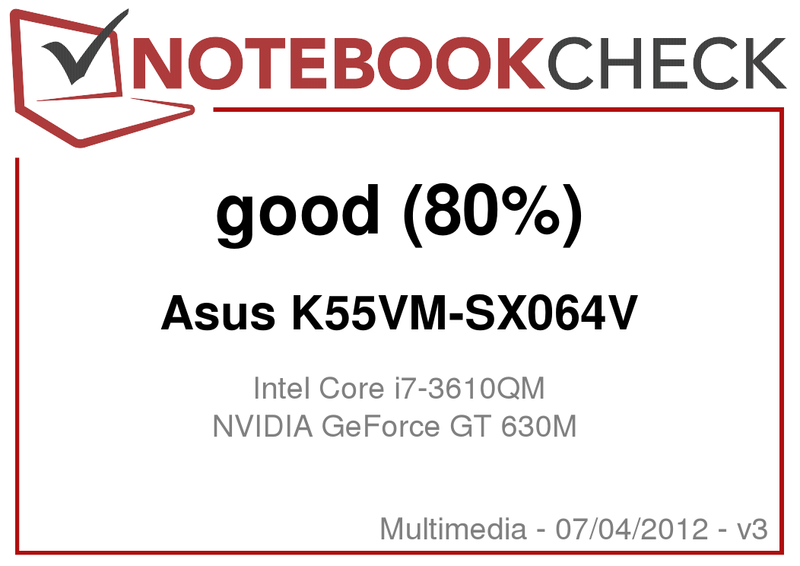 To really be an "all-round notebook", the Asus K55VM-SX064V has to offer the possibility to play the latest computer games at decent resolutions. It does do that. The 3DMark tests show that the GPU is capable of good performance. The GPU was tested for gameplay performance. Playing games smoothly in medium quality settings at the native resolution of 1366x768 pixels is not a problem. Even with high quality settings, most games ran smoothly at native resolution. All tested games could be started in Full HD resolution (1920x1080 pixels) with the highest quality settings. However, only Fifa 2012 runs smoothly. The game "Dirt 3" achieved unusually high frame rates in the benchmark. 28 fps at the highest quality settings at Full HD resolution (1920x1080 pixels) was a surprising result. This value is normally not possible for the Nvidia GeForce GT630M. Therefore, we have removed it from the test suite and we could not identify any anomalies in the implementation of the benchmarks. Despite its powerful components it is a silent device. The fan runs constantly, but little is heard. Only under load does the fan get loud. This never occurred during our ‘everyday usage’ simulation. For a device with a quad-core processor and mid-range graphics card, the measured values ​​are very good. The Asus K55VM-SX064V has the proprietary “IceCool” design where Asus has taken great care to make sure that the notebook produces as little heat as possible and this heat is kept away from the palm rest. This gives you an extremely comfortable working experience. In idle mode, the temperatures are well below 30°C on both sides of the unit. Under load the temperatures do rise but they are low enough for you to continue working without any discomfort. Users should note that the bottom of the laptop does get uncomfortably warm preventing the laptop from being used on the lap for too long. A major fault we have to mention is the repeated shutting down of the laptop during the stress test. The cooling system simply doesn’t have the ability to efficiently dissipate the generated heat fast enough to prevent emergency termination of the laptop. This was observed when FurMark and Prime95 test were run simultaneously on the laptop. But most users will not come across this problem as most users will not put the laptop through such severe workloads. Asus uses Altec Lansing speakers. These sound pretty good for notebook speakers. The sound is load enough but has no bass. Asus ships the K55VM-SX064V with a 120W power supply. We found the power supply to be adequate for the needs of the laptop. Under full load, we measured a power consumption of 105.6W. Under moderate load, the power consumption of the notebook is around 60-80W, depending on the specific load test. 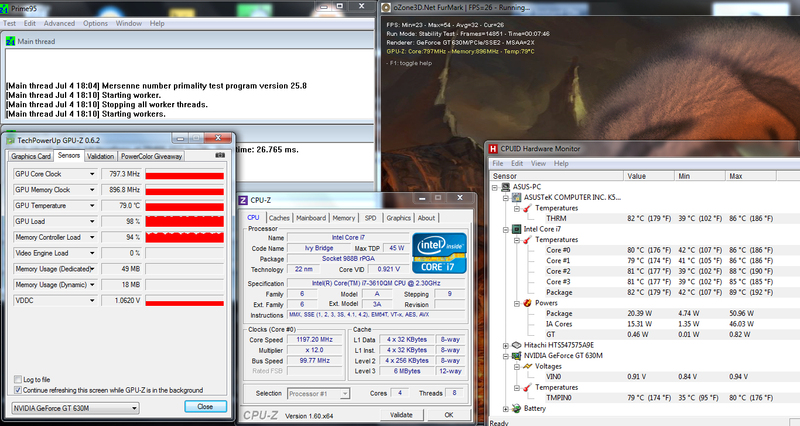 All in all, the power consumption for a notebook with an Intel Core i7 quad-core processor and a decent GPU is normal. For a notebook with a quad-core processor and a decent GPU, the device achieves good battery life. The battery did last for almost 5 hours and 30 minutes in idle mode with the screen brightness at its lowest. At load, the battery drains out pretty quickly due to the powerful hardware, having a runtime of just 1 hour and 6 minutes. For the WLAN test, the laptop was able to last for 3 hours and 44 minutes. The test includes websites being opened automatically by a script at 40second intervals. This is with the energy saving profile active and the display brightness set to about 150cd/m². The DVD test also provided a similar value of about 3 hours and 36 minutes. That is the average length of two feature films. The DVD test checks how long DVDs can be played on a single charge. The wireless modules (WLAN, Bluetooth) are turned off and the display is set to maximum brightness. Asus has a decent all-round notebook with the K55VM-SX064V. It provides enough power for all possible application scenarios, which includes video editing and computer games. With the Intel Core i7-3610QM processor, the device has excellent data crunching ability. Asus could have had a really good contender at this price point, but few glaring mistakes prevent this from being a desirable laptop. This laptop would have been a good buy if it came with a good quality display, a snappy hard drive and at least a BluRay combo drive.